CoverID® reinvents the interaction between a venue and its patrons by being an intuitive, easy to use, accurate solution for bars, night clubs, and other venues with age restrictions on entry. It is much more than a tool for doormen; CoverID is a patron management system. No longer does management need to depend exclusively on their staff to manually check IDs before individuals enter or are served. Using CoverID at a venue is like turning the lights on and seeing who your patrons are for the first time! This helps you reach your customers better and grow your venue by catering to its core market. Using Apple® iOS devices and an enterprise class barcode scanning / MSR sled CoverID makes it easy to age-verify patrons at the door and allows them to instantly pay cover by swiping their credit card. Aside from scanning and cover payments, CoverID also provides highly detailed and customizable patron analytics, which are useful for targeted promotions and demographic identification. CoverID works with all drivers’ licenses, military ID’s, and government ID’s from all 50 US states and Canada. Protect your bar, nightclub, restaurant, or retail establishment from underage alcohol consumption while processing payments at the door and gaining valuable insight on patron demographics with CoverID by Dryrain Technologies. Ultra portable, highly intuitive, no training needed. 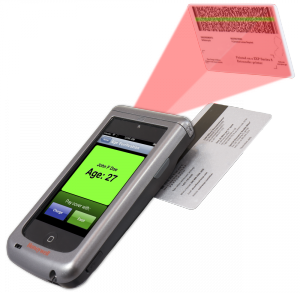 CoverID automatically sets up the scanning sled for zero hassle, zero-configuration operation!